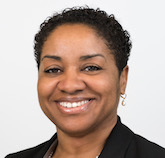 Karen Amaker is the founding director of the Norwalk Early College Academy (NECA), the first P-TECH 9-14 school in the state of Connecticut. Karen began her career in education in 1995 as the director of Summerbridge New Haven, a national education non-profit located at Hopkins School. During her tenure, Karen was instrumental in advancing the program’s mission to build a new corps of young teachers and expanding the public-private collaboration between Hopkins and New Haven Public Schools. Karen worked closely with New Haven school leaders to establish year-round after school tutoring programs at numerous middle schools throughout the city and employed high school students as tutors. Karen resigned her position at Summerbridge in 2000 yet continued her service to students as program coordinator for A Better Chance in Connecticut and New York. Karen’s work with private schools eventually led to her being recruited to lead the middle school division of Presidio Hill School in San Francisco, California; Presidio Hill is the oldest progressive school in California. Upon returning to Connecticut several years later, Karen assumed the position of director of educational opportunity programs at Yale University School of Medicine. While there, Karen supported students enrolled in the minority medical program and directed the S.C.H.O.L.A.R.S program. S.C.H.O.L.A.R.S provided public high school students with a residential summer learning opportunity on the Yale University campus. With a passion for public education and commitment to providing quality educational experiences for all learners, Karen eventually made her way to the public school setting. She served as a school counselor at Wilbur Cross High School and college counselor at New Haven Academy (NHA). Karen placed 100% of NHA’s seniors at college and universities across the country. Karen joined Norwalk Public Schools in 2007 and, in her ten years with the district has assumed the role of school counselor, guidance department chair, and assistant principal. She was hired as NECA’s founding director in 2014. Karen’s educational background includes an Associate of Science degree from Gateway Community College and a Bachelor of Science degree from Wesleyan University. She completed graduate work at Southern Connecticut State University and earned two Masters of Science degrees in Sociology and Community Counseling, as well as a 6th Year Professional Diploma in School Counseling. Karen earned her certification in Educational Leadership from Sacred Heart University. She is a former Urban School Leaders fellow and Relay Graduate School of Education National Principals Academy Fellow. Karen enjoys spending time with her eight-year-old son, Kristopher. She also enjoys traveling, photography, and reading.